When is Easter this year? It’s a question that vexes us and causes all sorts of problems with holidays and school terms. Unlike Christmas, which always falls on the 25th December, Easter is a moveable feast that can occur any time between the 22nd March and the 25th April. In 325, the Council of Nicaea decreed that Easter should fall on the first Sunday after the first full moon occurring on or after the vernal equinox. In 725, Bede wrote ‘The Sunday following the full moon which falls on or after the equinox will give the lawful Easter’. The flaw in this arrangement was that when the Gregorian Calendar replaced the flawed Julian Calendar in October 1582, famously robbing people of ten days of their lives, it was still not perfect and although the Catholic church presumed that the vernal equinox would fall on the 21st March, in reality, the vernal equinox doesn’t always fall on the same date. It can be on the 19th, 20th or 21st, and this year it is on the 20th March because it is a Leap Year and we have gained a day. The problem for both these calendars is that there aren’t exactly 365 days in the year. There are six spare hours. It’s why we have a Leap Year every four years, although even that is not strictly true because there are some times when we don’t need to have one. The rule is that a year whose number is divisible by four is a Leap Year, unless it is divisible by 100 but not 400. This means that although 1600 and 2000 were Leap Years, 1700, 1800 and 1900 were not and 2100 won’t be either. When the Gregorian Calendar was introduced by Pope Gregory VIII in 1582, the Protestant Queen Elizabeth I refused to adopt it. Instead, the Tudor magus, John Dee, came up with an alternative – a new Protestant Calendar. that was based on a 33 year cycle (the number of years in Jesus’s life). Dee’s calendar has seven four year periods, in which the fourth is a leap year, followed by a five year period in which the fourth year is a leap year. He also calculated that this calendar would ensure that the vernal equinox always fell on the 21st March, provided that it was used at the correct longitude. The snag was that Dee’s calculations placed God’s Longitude somewhere on the east coast of America, in places that were already being colonised by the Spanish Catholics. Dee advised the queen that an expedition should set out to North America to take possession of at least some of the land through which this longitude ran and it has been suggested that the scientific mission to Roanoke Island was to take measurements to try to establish the exact position of God’s Longitude. It also seems possible that one of the main reasons for the colonisation of Roanoke Island was so that this superior Protestant calendar could be implemented, showing the pope in Rome that his calendar wasn’t quite good enough. It never happened though. What happened to the Roanoke Colonists remains a mystery, and in 1752, England lost 11 days and the Gregorian Calendar we still use today brought us into line with much of the rest of the western world. Then, in 1884, Greenwich became the Prime Meridian, the place where the day would be deemed to begin. God’s Longitude was forgotten and now lingers unobserved somewhere on a line that includes New York and Guantanamo Bay. 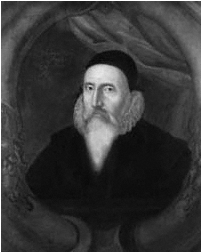 John Dee also fell from grace and was side-lined from the court, ending his days in poverty at his home in Mortlake. And in case you’re still wondering about Easter 2016, the moon is full on the 23rd March this year, so the following Sunday, the 27th is Easter Day. And watch out for my next novel, The Merlin’s Wife, which will follow the story of John Dee’s wife, Jane Fromonds, as she travels with him across Europe in the company of Edward Kelley. Does it include the infamous wife swapping incident? You’ll have to read it to find out.